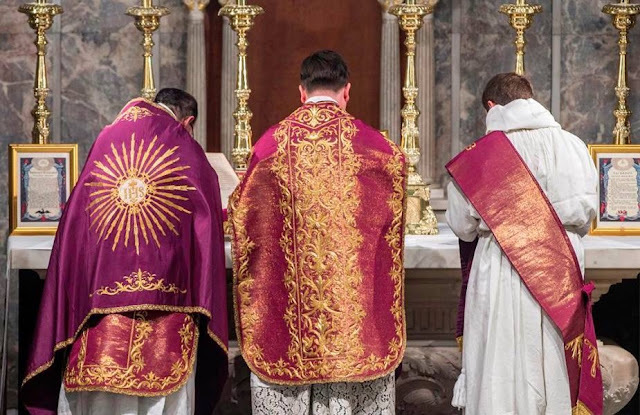 With Advent upon us, it seemed useful and pertinent to do an article on the subject of the folded chasuble, focused on both its history, as well as various stylistic examples found within the tradition of Western vestment arts. 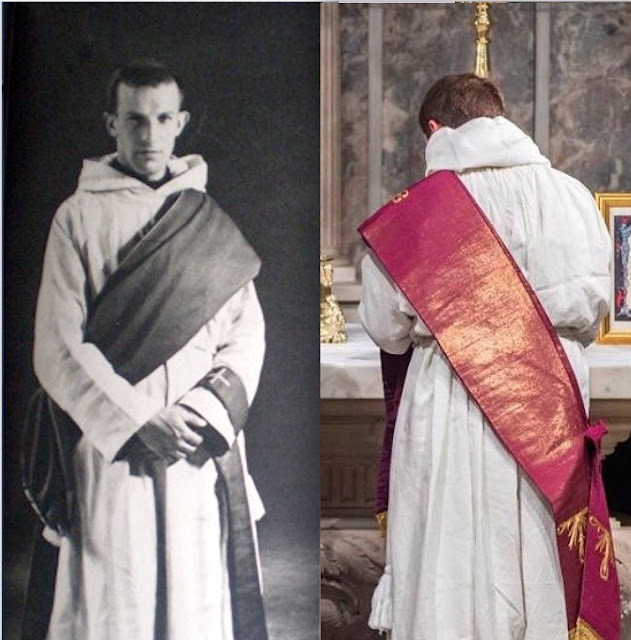 The folded chasuble, or what is referred to in Latin as the planeta plicata, and the stola latior, or broad stole (the folded chasuble folded in the form of a sash, worn rather like a diaconal stole), are a particular curiosity to many these days and they have seen something of an honest, grass roots revival in recent years -- an arguable example of how things can and do organically develop; in this case in the form of a slow and gradual restoration of a vestment form that was, perhaps precipitously, dispensed with in the mid 20th century. While there may have been a time in recent memory where the veils of immemorial history perhaps were thought needlessly and catechetically confusing and better dispensed with, the liturgical trials and privations of the recent decades have brought forth a new situation where there is an ever growing appreciation, even thirst, for both the understanding and practice of these long lived and ancient traditions. 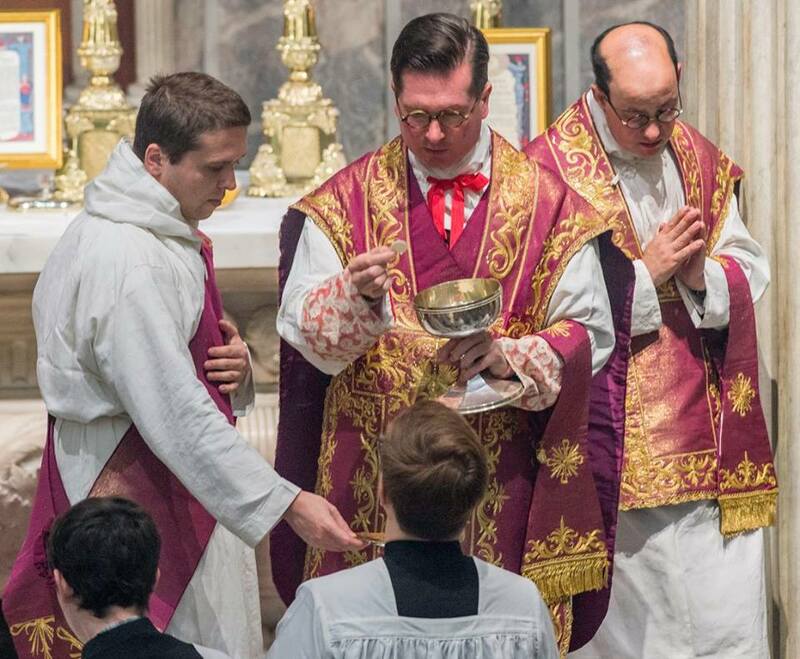 In our time we are particularly accustomed to think of the chasuble as a uniquely, and exclusively, priestly garment. As such, any consideration of the history of planetae plicatae is necessarily bound to a consideration of the early origins and use of the chasuble itself. 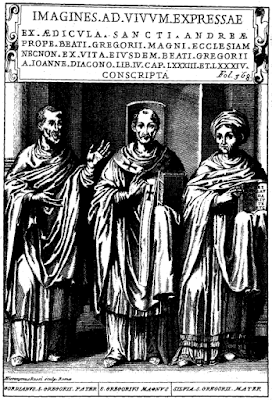 Various historians surmise that the chasuble was originally derived from a common form of civil dress in the Roman empire. An example of this more common form can be seen in a depiction of Gregory the Great with his parents. (See right.) This is important to understand if we are to move beyond the modern lens through which we see the chasuble and comprehend how this ancient usage came to exist -- and it will also help us better appreciate the antiquity of it. By a certain point, possibly the 6th century, the chasuble became an exclusively ecclesiastical garment, but not an exclusively priestly garment. Various ranks of clergy enjoyed its use in the earlier centuries and Archdale King notes in The Liturgy of the Roman Church that "in some churches, chasubles were worn by acolytes until the 11th century." 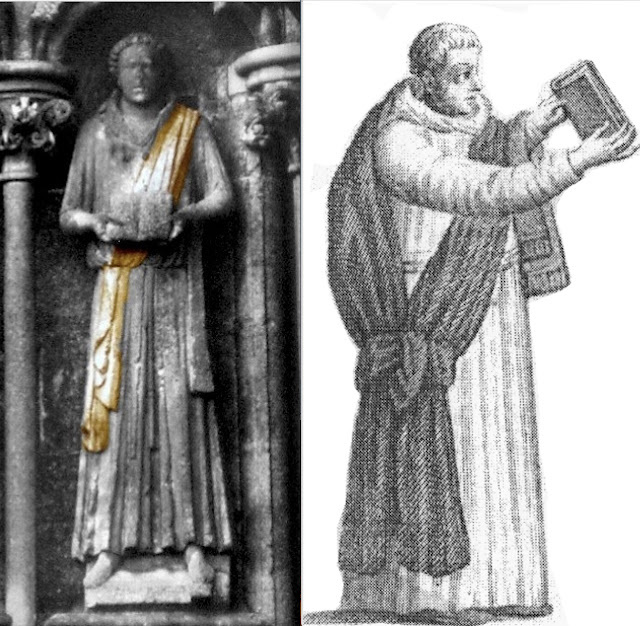 The Carolingian era liturgist, Amalarius of Metz, notes this more general use of the chasuble in the Liber Officialis where he comments: "Ministers remove their chasubles when they undertake the job of lector or cantor... The lector or cantor at his individual duty wears an alb with no chasuble..." So then, we can see that earlier times saw a more general use of this garment. ...the Roman Church uses violet from the first Sunday of Advent until the Mass on the Vigil of the Nativity inclusively, and from Septuagesima until the Mass on Easter Eve exclusively of the latter, whenever the Office is of the season; except upon Maundy Thursday and Good Friday... And be it understood that upon Holy Saturday violet is to be worn at every office which has a place before Mass; with this exception, that the Deacon who blesses the Paschal Candle, and the Subdeacon who serves him, are vested respectively in a Dalmatic and Tunicle of white... 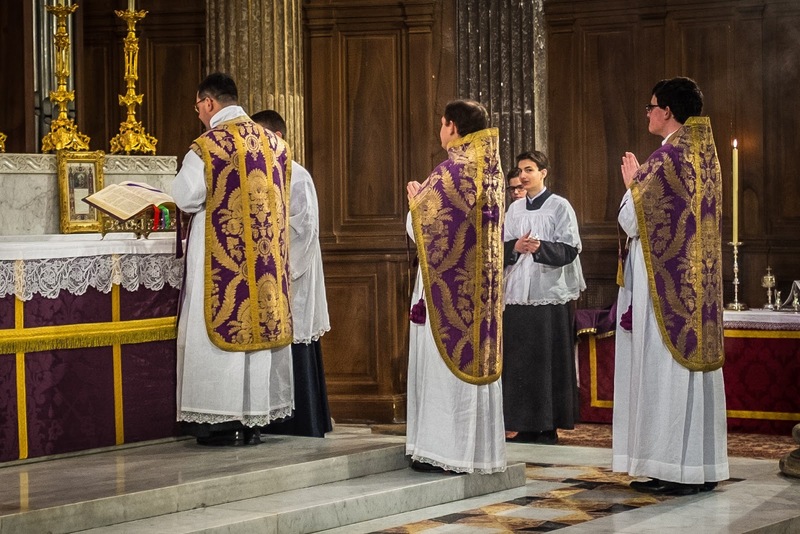 But after the Blessing done, the Deacon lays aside his Dalmatic, and putting on a violet folded-chasuble keeps the same even until the beginning of Mass. -- Chapter. XVIII, "Of the Four Colours which the Church Uses in Her Vestments"
In modern usage, the basic rubric is that folded chasubles are worn in place of dalmatic and tunicle on days of fasting and penance when violet is worn. This includes the Sundays and weekdays of Advent and Lent -- with the obvious exception of the "rose" Sundays -- as well as Ember days (except those in Whitsun) and during the Candlemas blessing of candles and procession. Folded chasubles in the liturgical colour black were also used on Good Friday. Of course, whatever is said of the folded chasuble also applies to the broad stole, which is really just another form of the folded chasuble. 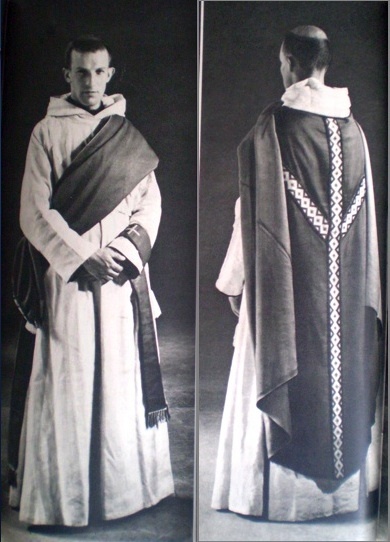 Folded chasubles were used generally through the Western liturgical rites and uses, with a few variations and exceptions. For example. 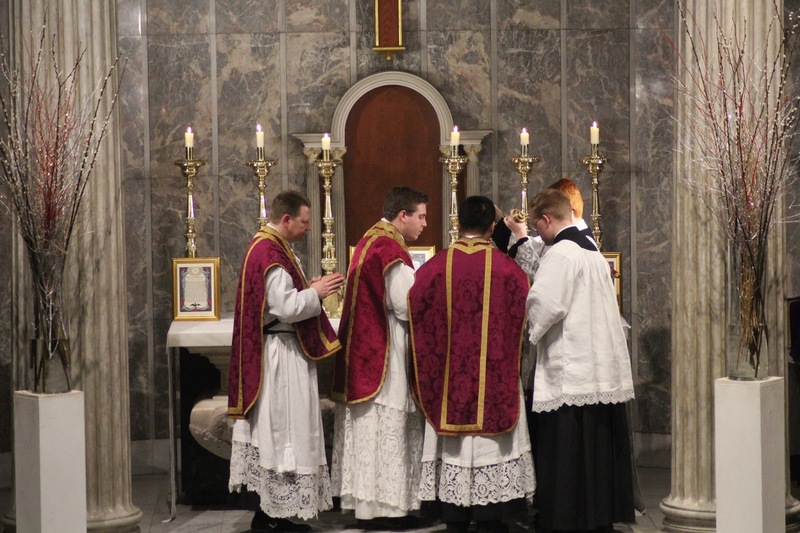 the Ambrosian rite did use them during Advent, Lent and the Lower Litanies, though on Good Friday the deacon wore a red dalmatic. The Premonstratensians have the distinction of expanding the use of the folded chasuble by utilizing them also for the pre-Lenten season of Septuagesima. 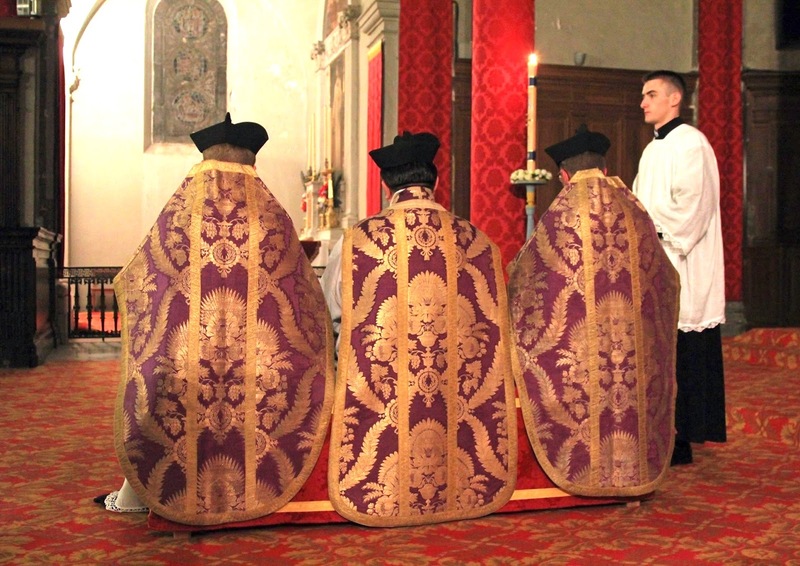 In the Lyonese rite, folded chasubles were used as per the Roman rite, but not on the first Sunday of Lent since, traditionally, Lent was considered as beginning on the first Monday in Lent; nor were they used on Good Friday. 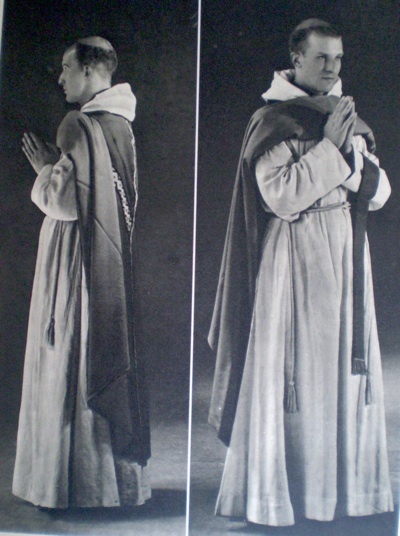 In the rites of the religious orders such as the Dominican, Cistercian and Carmelite rites, folded chasubles were not worn, however neither were dalmatics worn at those times when they would have been. 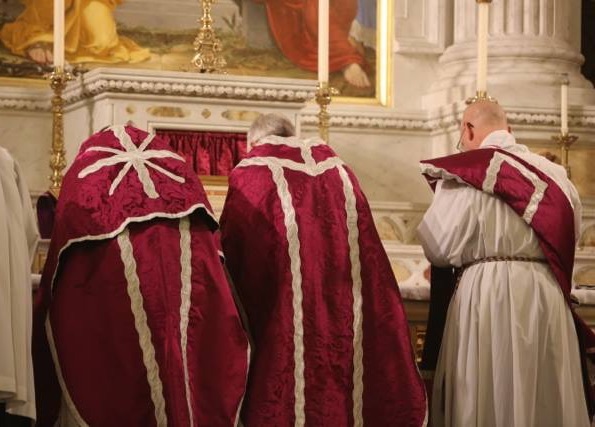 The same can be said of the Carthusian rite, though it is worth noting here that the deacon never wears a dalmatic in general in that rite (wearing instead the cuculla ecclesiastica) and there is no subdeacon within their liturgical rites. In terms of the forms of the folded chasuble and broad stole as they developed, like the chasuble itself, the folded chasuble saw various manifestations as the centuries went by, moving from its ancient and fuller form to something more truncated and streamlined later on. There are two ways of thinking about this. One in relation to the style of the chasuble being folded, and the second in relation to the method of folding itself. The two are, of course, somewhat interrelated by a certain point. In terms of the method, the German liturgical scholar, Joseph Braun, S.J., notes in Die liturgischen Paramente that in earlier centuries "the deacons pulled the chasuble... up to the shoulders." He continues: "They then removed the vestment, wound it - together with the stole.. - like a sash across the back and chest to the right side." Left: From the facade of Wells Cathedral. The vestment has been highlighted. Right: Another view of the same from an illustration. Braun notes that the usage of the subdeacons was, however, slightly different; "...they ordered the chasuble somewhat different than the deacons, that is to say in such a manner, that it formed a puff in the front, probably in order to make use of it for touching the sacred vessels and books..."
The black folded chasuble on the right is actually folded and attached in place. The two on the right are the cut form which simulate the same effect. Left: Broad stole in the ancient form. Right: A truncated form which simulates the ancient form. Here are just a few examples of the folded chasuble which highlights variations in its form taken from different eras and forms of the chasuble. Next we proceed to s set which has a more Borromean cut. Here we see that the folding has been replaced with the truncated form of front which approximates the folding in the front that you see above. As noted however, the cut form of the chasuble was not necessarily what was always employed even in the baroque style. In some instances the front was still actually folded, or stitched up. For a more detailed exposition on the history and rubrics surrounding the folded chasuble, see my 2009 article on New Liturgical Movement: Use, History and Development of the "Planeta Plicata" or Folded Chasuble.